It may be time to close the book on Barnes & Noble. Folks just aren't buying physical books these days, and the retailer's Nook hasn't been the lifeboat that the company envisioned when it rolled out a way to cash in on the migration to digital reads. The death of rival Borders -- an event that seemed to trigger an opportunity -- is now merely a literary practice called foreshadowing. Shares of Barnes & Noble (BKS), the last major bricks-and-mortar bookseller, took a 12 percent hit Tuesday after announcing disappointing quarterly results. Revenue declined 8.5 percent, and it could have been worse if not for a slight uptick in Barnes & Noble's college bookstore business. At the namesake stores that we all used to frequent more frequently, same-store sales plunged 9.1 percent. Investors used to dismiss weakness at the retailer's physical stores, figuring that the company would eventually make that back through its digital e-reader initiatives. Well, the news is even worse on that front, as Nook revenue fell by a little more than 20 percent during the period. Everyone knows how this story will end, even if there are too many people that don't want to spoil the ending for others. Several months ago it seemed as if the troubled chain had at least two ways out of this mess. Microsoft (MSFT) paid up for a minority stake in the company's Nook and college bookstore business. Founder Leonard Riggio expressed interest in acquiring the original retail bookstore business. It was perfect. Microsoft or any of the subsequent Nook investors could've acquired that subsidiary to take on Apple's (AAPL) iPad or Amazon.com's (AMZN) wildly successful Kindle. Riggio could have then taken back the namesake bookstore chain that he started. Even if one walked, shareholders would be able to cash in on the money raised by selling the other. Well, that story doesn't have a happy ending either. Riggio revealed on Tuesday that he is withdrawing interest in taking the retail business private. This leaves potential interest in the Nook business, but who wants to buy a fading digital platform? Nook's 20.2 percent decline in sales during the last three months hurts, but what's even worse is that devices and accessories revenue tumbled 23.1 percent in that period. In other words, the interest in Nook by new readers is fading even faster than the digital sales to existing e-reader owners. Why would Microsoft want that? Nook is not much of a hook, and it's not as if the software giant doesn't have enough to worry about in trying to revive its operating system at a time when PC sales are falling nearly as quickly as Nook sales. There's no shortage of scapegoats. Barnes & Noble blames the retail-level weakness on a lack of hit titles. It points to last year's success of the "50 Shades of Grey and Hunger Games" trilogies in propping up sales. However, even the chain concedes that comps would have still been negative even if neither trilogy existed last year. In explaining the continuing slide of Nook popularity, Barnes & Noble offers up another excuse that doesn't hold up. "We spent substantial time and resources last year preparing our individual businesses to operate independently in anticipation of the potential for their separation," Nook's head said during Tuesday's conference call. Now that the trial separation isn't working -- the chain and the e-reader are stuck with one another -- Barnes & Noble feels that it can work on integrating the two businesses. That's a tough chapter to swallow. It's hard to see how two platforms fading in popularity can help one another at this point. Amazon has no problem growing its Kindle business, and it's doing so without any kind of store presence. Borders tried to push its non-Nook and non-Kindle e-readers on its shoppers all the way until the end when it had to mark them down in its liquidation sale. The near future doesn't look pretty. Barnes & Noble continues to forecast declining sales for the entire fiscal year. Wall Street's paid to have a longer view, and that's only uglier. Analysts see Barnes & Noble's deficit widening from $1.01 a share this year to $1.28 a share next year and a brutal $2.45 a share loss the year after that. We know how this story ends, and today's investors may be well served by more savvy market watchers ruining the ending for them before the ending ruins them. Motley Fool contributor Rick Munarriz has no position in any stocks mentioned. The Motley Fool recommends Amazon.com. The Motley Fool owns shares of Amazon.com and Microsoft. The holiday season was rough for Best Buy (BBY). Same-store sales declined by 1.4% year-over-year, with international stores posting a 6.4% decline while U.S. same-store sales were flat. Company-wide, the electronics retailer reported that holiday revenue had declined to $12.8 billion from $12.9 billion the year before. In the most recent completed quarter, during which same-store sales declined 4.3%, the company reported a loss of 4 cents per share. Best Buy has been plagued by the trend of "showrooming" -- customers using stores to get real-world looks at products, then purchasing them online. Speculation persists that former chairman and founder Richard Schulze may buy the company and take it private. Both Sears and Kmart have been going down the tubes for a long time, steadily losing their middle-income shoppers to retailers such as Walmart (WMT) and Target (TGT). Sears Holding's (SHLD) same-store sales have declined for six years. In the most recent year, same-store sales at the namesake franchise fell by 1.6% and at Kmart by 3.7%. The company is already in the process of downsizing its brick-and-mortar presence. In 2012, Sears announced it was shutting 172 stores. CEO Lou D'Ambrosio is leaving in February, to be replaced by Chairman and hedge-fund manager Edward Lampert, who has minimal operating experience in retail management. J.C. Penney has been going through a rough stretch. In the most recent quarter, same-store sales fell by 26.1% year-over-year. Even its Internet sales have taken a turn for the worse, falling 37.3% in the third quarter, compared to the prior year. The retailer's current troubles began after former Apple (AAPL) retail chief Ron Johnson took the helm and launched an ambitious transformation plan that, among others things, aimed to wean customers off of heavy discounting and coupons, and simply give customers low prices right off the bat. Instead, retail strategists and analysts say, Johnson's vision has created confusion among customers and inhibited any potential turnaround. Office Depot's (ODP) troubles can be traced back to years of competition against OfficeMax (OMX) and Staples (SPLS), as well as big-box retailers like Walmart. All three major office supply chains suffered from reduced business activity during the recession, as well as the rise in popularity of online retailers such as Amazon. The company's North American division reported an operating loss of $21 million in the third quarter of 2012. Office Depot plans to relocate or downsize as many as 500 locations and close at least 20 stores. In the third quarter of 2012, the company closed four stores in the United States, and same-store sales were down by 4 percent year-over-year. The shift by customers away from print books toward digital books has hurt Barnes & Noble (BKS). Same-store sales during the nine-week holiday season fell by 8.2% year-over-year. The bookseller has tried to offset the declines in physical book sales with its Nook e-book reader, but sales of that device fell 13% compared to the previous year. The company has already been reducing store count over the past several years. In a recent interview with The Wall Street Journal, the head of the retail group at Barnes & Noble said he expected the company to have just 450 to 500 stores 10 years from now. In November, with the holiday season just getting into full swing, GameStop (GME) announced it would close 200 stores in 2013. The video game retailer, hurt by growth in mobile gaming, which came at the expense of traditional console gaming, saw year-over-year revenue decrease 4.6%, and comparable-store sales fall by 4.4% for holiday period. For the third quarter of 2012 (the most recent for which numbers have been released), gross profits fell for GameStop's three core product segments: new hardware, new software and used products. OfficeMax, like rival office-supply stores such as Staples and Office Depot, has been hit hard by both online competition and falling sales for technology products such as personal computers. In the third quarter of 2012, OfficeMax reported that same-store sales in the U.S. fell by 2.6%. Midway through the fourth quarter of 2011, the company announced that it would close 15 to 20 stores every year for the next five years. In addition, the company is in the process of downsizing by moving into smaller locations. Earlier this month, RadioShack's long-term prospects took another hit when its partnership with Target ended after the two retailers were unable to design a mutually beneficial deal. 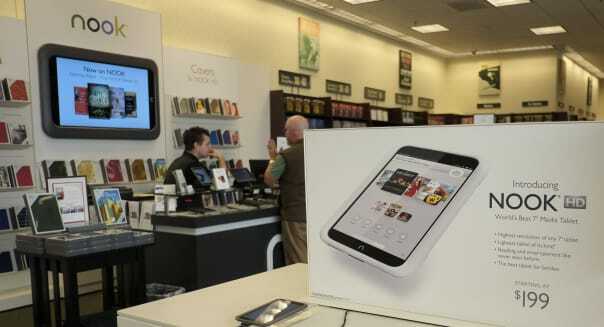 RadioShack had operated mobile kiosks at 1,500 Target locations across the country. The company recorded an operating loss of nearly $60 million in the third quarter of 2012, when same-store sales dropped by 1.6% year-over-year and revenue fell by 3.8%. In 2010 and 2011, the company closed 2.2% of its existing locations -- more than 120 stores in all.